The search functionality of your ecommerce site is one of the most important tools of conversion. About 88% people research online before buying a product. But often times, a simple spelling mistake can make you lose potential customers. Suppose you are looking for children’s books on Amazon.com. What happens if you mistakenly type childrn’s book age 1 to 5? Note that a simple typo returns 0 results for your query. While a big site like Amazon can get away with this, your ecommerce site will definitely face a decrease in conversion if your search bar can’t suggest correct spelling alternatives. The spelling mistake is not the only thing that your search bar should address. For our second example, suppose someone is searching for women’s blue jacket under $100. 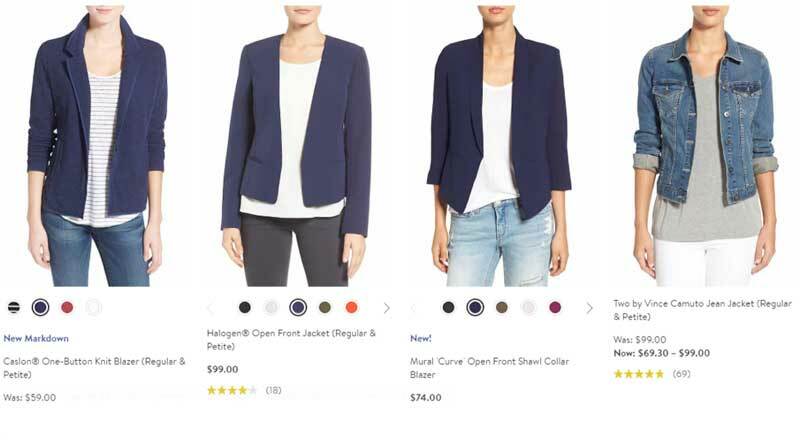 A typical text-based search will return a thorough list of products containing the keywords women’s, blue, jacket, under and $100. So, you can see, the search functionality differs from site to site. And if your site search can’t produce a relevant result for your customers, your conversion rate will plummet. It’s clear that site search is pivotal for successful conversion. 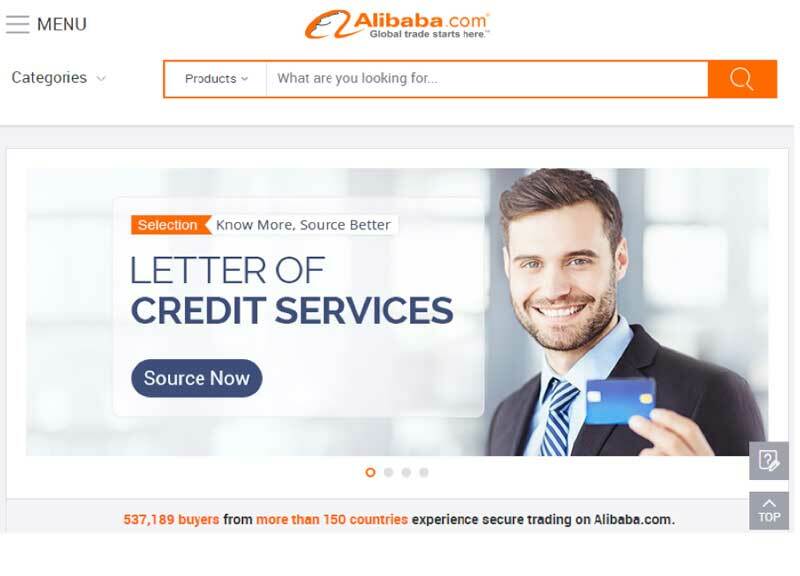 But why do some ecommerce sites produce accurate or relevant search results while others fail? Because many are still using Text-based search engines to handle on-site product queries. 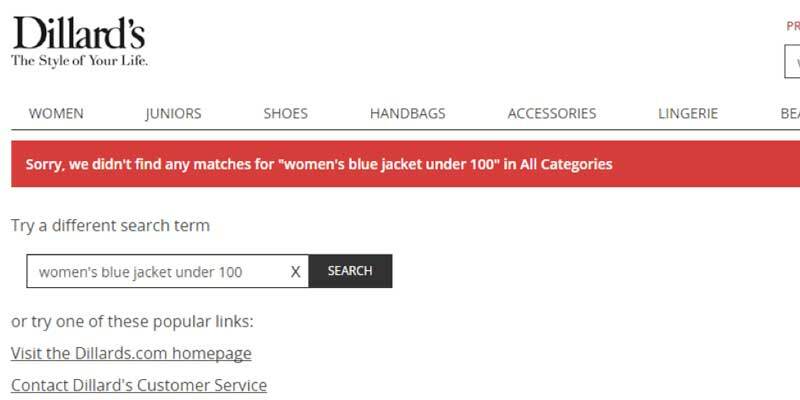 In our example, a Syntactic search engine cannot properly search for women’s blue jacket under $100 due to above reasons. A modern ecommerce search engine should understand that the first part of the search term is related to product name and description. The second part denotes the price range (in our particular example). The search engine should also understand that the primary item being sought by the customer is jacket. The words women’s and blue are descriptors or adjectives. In short, a modern ecommerce search engine is expected to have Natural Language Processing capability and some level of Artificial Intelligence to produce accurate results. Semantic search uses both Natural Language Processing and Artificial Intelligence to understand long search terms (like chocolate bars under 5 dollars). By using Machine Learning techniques it can also develop an ability to understand the customer’s’ intent (i.e. identify the typos, recognize synonyms, show related products) as opposed to focusing only on specific keywords. The concept of Semantic search not entirely new. Apple’s Siri, Amazon Echo, and Google Assistant use similar technology to understand people’s speech. Apart from improved ability to present relevant products to the customers, there are many other benefits of Semantic search over the traditional Textual one. Text based search often gives the wrong or null result to a certain combination of terms. To improve customers’ experience, you need to manually correct the results for these cases. The process is time-consuming and difficult. But by using Machine Learning techniques Semantic search can automatically optimize the search results and gradually improve in performance. Based on click-through rate, the Semantic search can re-rank products according to customer interest. As a result, customers are likely to find most useful products at the top of the search page. Semantic engines can suggest related products by analyzing previous search terms and based on top queries. For example: If you are searching for pajamas, the suggested products will also include trousers. Note that, the idea is not merely using synonyms to show additional products, but to understand that the customers looking for pajamas are likely to look for trousers and customers looking for shampoo, might also look for conditioners etc. With Semantic search, this process is automatic. Position: The search box should be visible across the entire site (along with the navigation bar). Ideally, it is placed at the top of the page. Label: Label the search box with color and shade so that it’s easily distinguishable. The search button should have a magnifying glass icon or contain the text Search. Text: The text in the search box should say something like – Search for products or What are you looking for? Make sure the in-box text disappears when the user clicks on the search box. Suggest related search items. For example: When the user types came…, your search bar should not only show camera, but also terms like camcorder and digital camera. Correct spelling mistakes. A good way to remind the user that they are making a possible spelling mistake is to suggest the correct spelling by saying – Did you mean …? However, don’t autocorrect the spelling without asking first. Show popular search terms as top suggestions. Your semantic search engine should have a dataset of past search terms and know which suggestions were found most relevant by the user. Based on data, the intelligent search engine should know which products are most popular among your customers. Configure your search box in such a way that it displays those best-selling items right at the search suggestions when someone searches a related term. Here is an example from Best Buy. 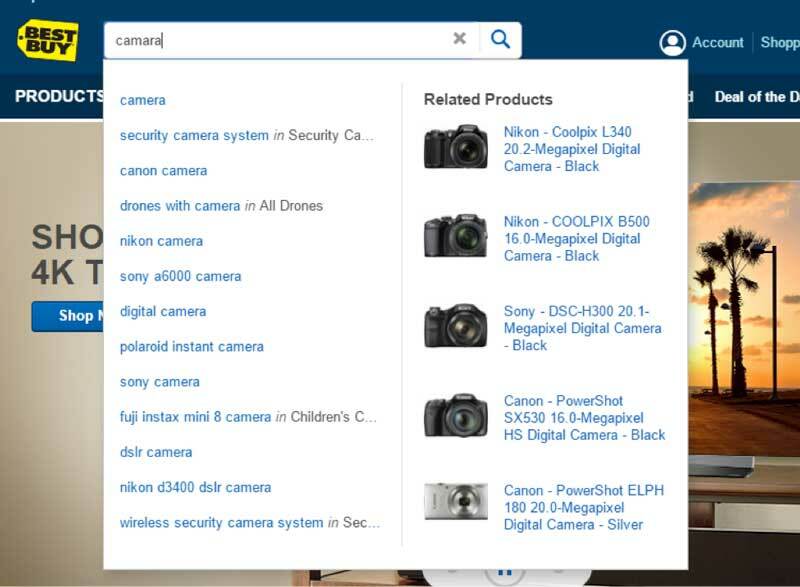 Note that when the customer types camara (a spelling mistake), the search box doesn’t only suggest the correct spelling and related search terms, but also displays the most popular cameras from its stock. The search result page is crucial for conversion. After reaching here, the customer will either leave or find something that she likes. So you must make the search results as customizable as possible. The best way to do that is to give customers ways to filter the results. With a semantic search engine, it should be very easy to understand what type of filters are needed for a particular search term. Semantic search is able to determine the difference between nouns and adjectives, making it easy to predict which filters the customer might need. 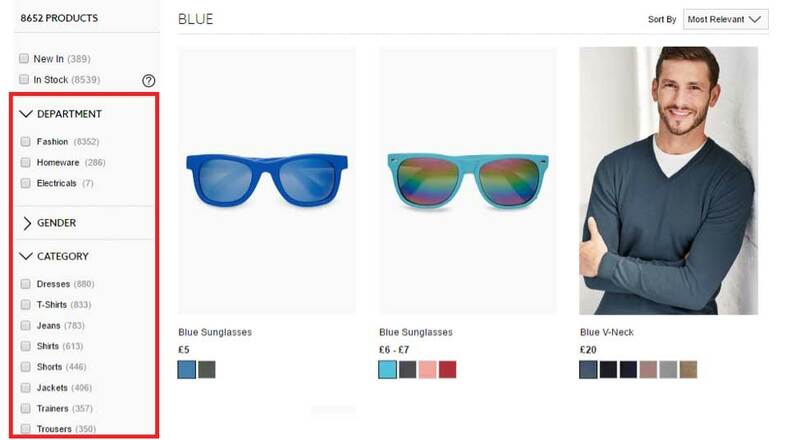 For example, when the customer is searching for shirt, then the filters should be based on categories (what type of shirt? ), gender (for men or women? ), color, brand, price etc. What happens when you search for blue? This is an adjective and the customer hasn’t mentioned what she is looking for. With the help of Natural Language Processing and AI, it’s easy to learn more about your customers. By compiling data from search, you can know your visitors’ demographics, buying preferences etc. Analyze frequently used search terms and the related products. 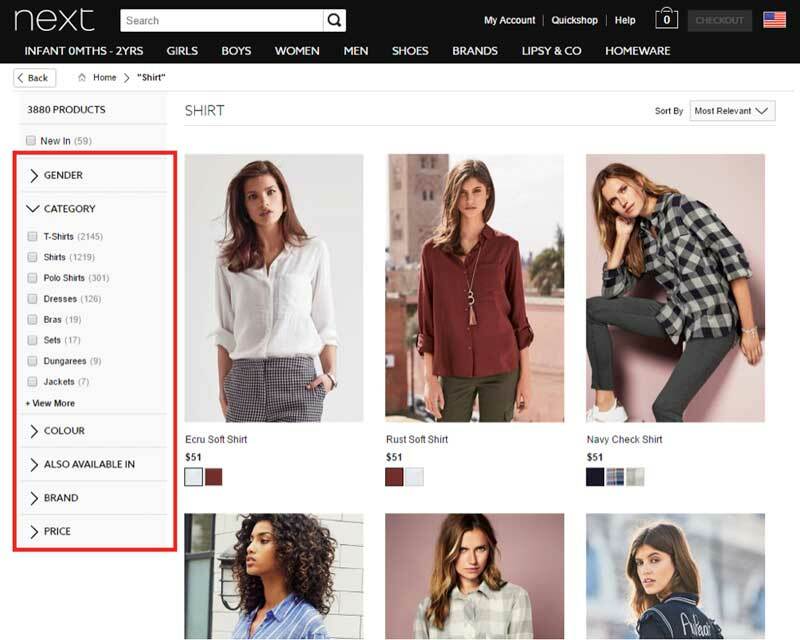 Then optimize the product page based on those search terms. Find which products the customers usually purchase together. By using this data you can pair products to create sales bundle. Encourage your customers to create an account on your site. This gives you an amazing opportunity to analyze their search and behavior data. Using this data you can customize search results and give special offers to your frequent visitors. Personalization based on age, location and demographic is a surefire way to convert. The most useful thing that you can gain by semantic data mining is to foresee customer demand. Intelligent search powered by deep learning can analyze even subtle cues which will be impossible to do manually via a text-based engine. To convert your potential customers, your search results should show them the products they are looking for. But the problem is, it’s not always easy to understand what they actually want by looking at the search term. In other words, there’s often a gap between what the customer wants and what she types. For example: When a potential customer is searching for brown cashmere sweater, she may also be interested in other related shades of brown. The term cashmere needn’t specifically be in the product name but in the blend. And the result page should also include products like Pullovers and Jumpers. Natural Language Processing can understand these search terms and automatically show appropriate products, something which is impossible by traditional search. 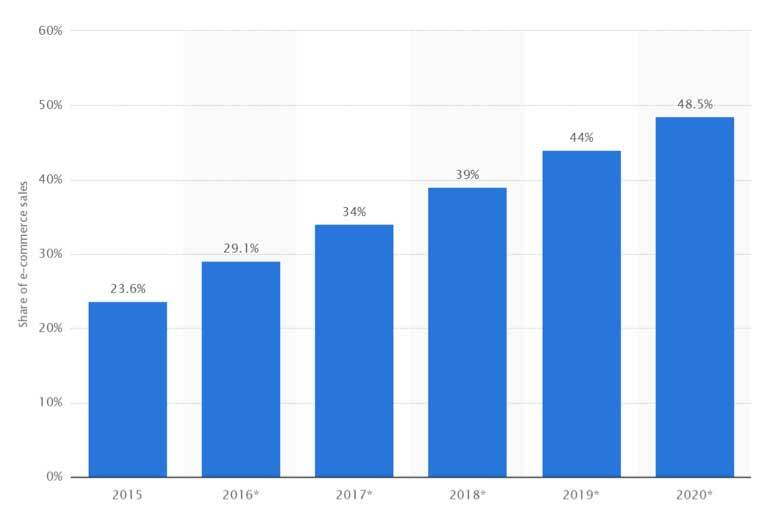 So, converting mobile visitors should be a key focus of any online store. Due to UX restrictions, search is the king in small screen sizes. In other words, when on a mobile device, the customers are most likely to do a direct search to find their desired product. This is where semantic search and AI will definitely outperform text-based searches. Moreover, with the rise of AI based assistants and smart home technologies powered by IoT, voice is going to be the next stage of human-computer interaction. Natural Language based search is the only way your ecommerce site is going to convert the customers in those upcoming days. AI based semantic search is quite a new technology. But there are several companies developing such tools that you can integrate into your ecommerce site. For example, Inbenta and Celebros provide Natural Language based search and merchandising. To integrate smart search in your ecommerce, consult with the respective providers. However, here’s a very brief overview of how the integration process may work. By using APIs: A more advanced but flexible way is to use APIs developed by your service provider. You will need to integrate the API with your site. Semantic search with Natural Language Processing and Deep Learning is going to bring the next revolution in search. With the rise of IoT and mobile devices, ecommerce sites must adapt to these new advancements to stay ahead in this competitive field. Compared to text-based search, NLP and AI can create a lot more frictionless, seamless shopping experience that will not only help you increase conversion, but also give you the necessary insights to grow your online business. As search engines like Google are becoming more and more dependent on semantic search, customers are likely to expect the same type of experience in ecommerce sites too. By being one of the early adopters of this relatively new search technology, you can gain a decisive advantage over your competitors in terms of customer conversion. Author bio: Liakat Hossain is a content marketing professional at ecommerce web design company WebAlive. He has been helping businesses grow by developing search and content marketing strategies since 2011. Connect with him via Twitter. Liakat Hossain is a content marketing professional at ecommerce web design company WebAlive. He has been helping businesses grow by developing search and content marketing strategies since 2011. Connect with him via Twitter.